Watch the magic of Ten-Frame Tiles unfold as five tiles on one ten-frame and three tiles on a second ten-frame combine to create a new look and a new entity — eight! Then, see the marvel of physically transforming ten ones into one group of ten when adding a one-digit number to a two-digit number. The light bulb went on! Not only did I learn new ways of teaching my students, I learned new ways of thinking about math for myself. KP Ten-Frame Tiles take the mystery out of division! In your mind’s eye, see how division-with-tiles matches and clarifies the standard division algorithm. KP Mathematics offers a variety of exciting resources for teachers and students. Explore KP Math programs for differentiated populations. 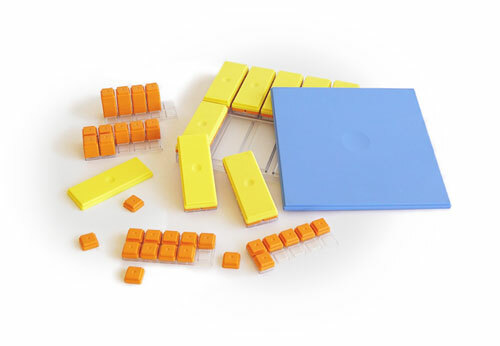 They use KP Ten-Frame Tiles as the manipulative of choice! Engage students in mental math practice as they put properties of operations to use in game play. Engage teachers and their leaders in developing content and pedagogical expertise.